SoundMagic P21S review | What Hi-Fi? The SoundMagic P21S headphones are smooth-sounding and comfortable to wear, but they're not quite the five-star performers we’re looking for. 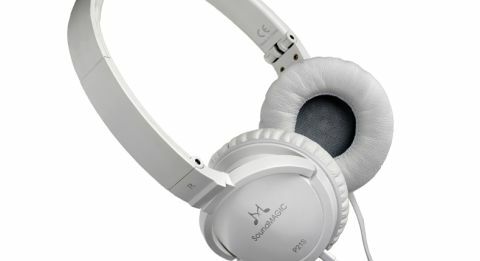 The SoundMagic P21S aren't the most detailed or precise-sounding headphones. They are, however, extremely pleasant and easy to listen to. The sound is smooth, warm and full of enthusiasm, but the edges of notes are rolled off to achieve that rounded quality to the sound, and outright subtlety is sacrificed along the way. The aggressive punch behind Rage Against the Machine’s anthemic Killing In The Name sounds rich yet lacks a touch of attack, while Leonard Cohen’s gravelly voice on A Street is softened around the edges – but the headphones do manage to keep the spirit of the song intact. Unlike the Yamaha HPH-M82s, the SoundMagics sound dynamic and engaging. The low end charges along merrily, punching deep enough to give weight and depth to songs. Voices are expressive and fluid. The fervent string-plucking in Paulo Mendonca’s blues-tinged Just in Case may not sound the most taut and agile, but it’s certainly packed with energy and the dynamic shifts are delivered admirably. The bass is a touch on the boomy side, which takes our attention away from top-end sparkle and bite. There’s no hint of brightness or sharpness, though, and we can thank the rolled-off quality for that. We like how inoffensive and immediately likeable the SoundMagics sound – despite their shortcomings. On the face of it, the SoundMagic headphones don’t exude quality. The build is cheap and plasticky, and the headband creaks when flexed. We can imagine them getting grubby quite easily, especially our review sample’s white finish (other finishes are available). But we stop caring about all that the second we slip the P21Ss on – they’re so comfortable. They’re light, with a stable grip that doesn’t feel too snug, and the ear pads are delightfully squishy and comfortable. They even offer a degree of noise-isolation, and you could while away the hours in Spotify-heaven without feeling encumbered by the headphones. The lightweight, foldable design means they’re ideal for portable use and easy to store in a bag, while the in-line control lets you pause your music to take a call. A switch lets you jump between using them with Apple and Android devices. Yes, there are clearer and more insightful headphones. Rivals such as the Beyerdynamic DTX 501 p offer an impressive level of subtlety and dynamics, and they’re also built to a higher quality. But what the SoundMagic P21S headphones offer is a warm and smooth presentation that’s easy on the ears, with enough punch and liveliness to keep us interested in what we’re listening to. They’re comfortable to wear, too. Give them a whirl.